In general, I've been staying away from starting to read new vampire books recently. Probably because after Twilight I went on a vampire book reading rampage, and got a little vampired-out. About a year ago I discovered the lovely world of faery books, which led me to read Julie Kagawa's Iron Fey series. That series soon became one of my favorites (and I also have a mega-crush on Ash!) So when I saw Julie Kagawa was writing a vampire book, I figured I would give it a try. And I'm SO GLAD I DID! 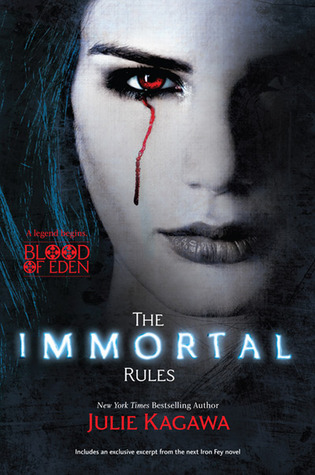 The Immortal Rules is a totally fresh take on vampires, and I absolutely loved it. The book takes place in the future where vampires have taken over, so it's more like a dystopian vampire story. The main character Allison starts off human, living in the Fringe, which is an area outside of a vampire city. The reader gets to see a decent amount of her life as a human, and what she has to do to survive as an unregistered human. She hates vampires, but when she's almost killed by rabids (vampire-zombies), a vampire comes to help her and gives her a choice: die or turn into a vampire. She chooses to turn into a vampire, and from there the whole story really took off. She learns about how vampires live from the vampire who turned her (Thus the name The Immortal Rules … ), but then after some trouble strikes, she's forced to go out on her own. She soon discovers a group of humans on a quest to find the only human-run city still out there, called Eden, and joins in with their group. They don't know she's a vampire though, so she has to pretend she's a human. And of course Julie Kagawa always has a great romance in her books, so a romance developed between Allison and one of the humans. I loved them together; their relationship progressed nicely and was well-done. This book had a great pace -- not too fast and not too slow. I always wanted to know what happened next, but the story never felt rushed, which was good. I love the vampire mythology that Julie Kagawa created; it was very original and with so many vampire books out there, it was nice to read something different. I also loved seeing Allison's character development from a human to accepting her life as a vampire. I definitely look forward to reading the rest of this series!